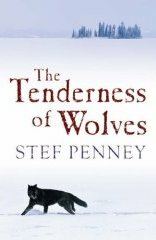 So many column inches dedicated to Stef Penney's agoraphobia and non-trip to Canada in connection with her Costa winning book The Tenderness of Wolves that I don't feel inclined to add much more to that aspect. Except you just can't help it. If agoraphobia is indeed the problem we are led to believe it is for Stef Penney, then in this book you have the literary equivalent of the anorexic cooking up a dinner party for twenty.Nothing like facing your demons third hand and through the written word, here Stef Penney offers detailed descriptions of vast acres of wild open spaces which must surely be her darkest fear. Actually, it's a misconception, agoraphobia is more a fear of being somewhere outside a person's control and then having a panic attack but even so I think the Canadian Wilderness would still seem to fit the bill. Nor does anyone need a trip to Canada to write a book like this. 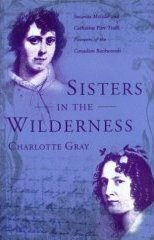 I read enough last year from the writing of Susanna Moodie and Catharine Parr Traill,19th century pioneers of the backwoods to feel as if I'd grown up there. Interestingly the names, Susannah and Donald Moody (one of the real Susanna's children was called Donald) appear in Stef Penney's book. I suspect she knew exactly where her inspiration had come from and perhaps used these names as a silent but grateful tribute. It was after all Susanna and Catherine's journals home to the other Strickland sisters back in the UK in the mid 1800's that were published and gained a vast readership as one of the only accounts of this harsh life to be written by women.Margaret Atwood has continued to maintain and shape those early perceptions with her 1970 cycle of poetry,The Journals of Susanna Moodie. But I digress and I said I wouldn't, back to The Tenderness of Wolves. I was bound to bond with a book set in a place called Dove River for a start and I was rapidly completely snowed in and wrapped up in the world that Stef Penney creates.A violent murder to kick things off and plenty of mystery and intrigue surrounding the life of the deceased trapper. Disappearances, snow-laden journeys, the unscrupulous Hudson Bay Company, feisty women and plenty of Native American culture all woven in. More present tense writing but it's a very well written book, ebbs and flows so you're not constantly dashing through the snow, you get plenty of time pondering by the fire or tucked up in a tent, a great winter read. Have a blanket and a hot water bottle at the ready and once you've finished this one be sure to read Sisters in the Wilderness by Charlotte Gray to find out exactly how amazing Susanna and Catharine really were and then you might as well accept the CanLit challenge and head straight for the Margarets, Laurence and Atwood.